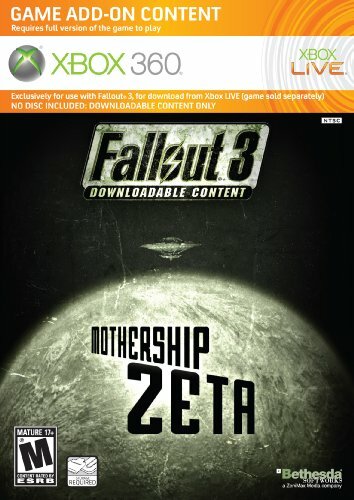 Mothership Zeta, the fifth and final installment of Fallout 3’s downloadable content, is a bit of a disappointment. The premise is undeniably cool and offers a welcome diversion from the standard nuclear wasteland: you begin to receive an unintelligble radio transmission, and after wandering to its source you discover a crashed UFO site. Upon investigating the wreckage, the spacecraft beams you up into Mothership Zeta, a massive aircraft in which aliens are holding other humans hostage. You wake up in a cell with another abductee, and the two of you team up with a few others to take down the unworldly bastards that are conducting god-knows-what experiments. The entire campaign takes place on the UFO, which is both a blessing and a curse. This is refreshing because it offers a different environment that is unique from the normal game. 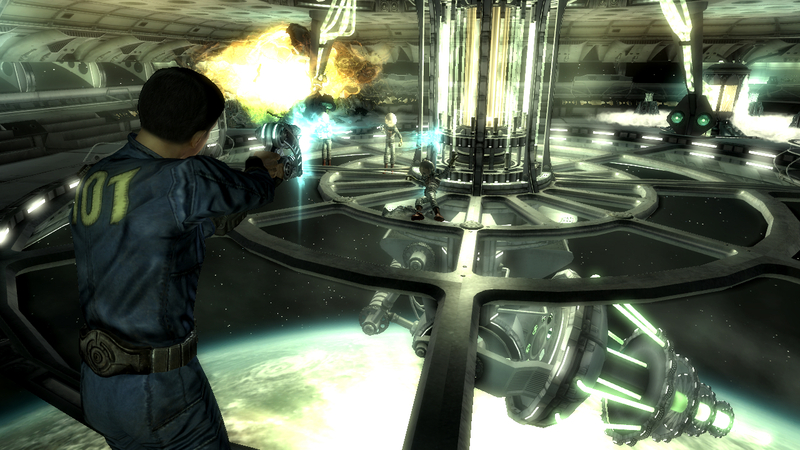 Unfortunately, it also completely wipes out one of Fallout 3’s greatest traits: the ability to roam freely. Mothership Zeta is a predominantly linear adventure that only offers corridor after corridor, with intermittent firefights behind certain doors. For those looking to explore a massive alien spaceship with lots of quirky nooks and crannies, you will be disappointed. Outside of a few amusing Easter eggs, there is little in the way of excitement. A greater variety of enemies would have helped break up the monotony, but there are exactly three nuisances to come across: aliens, sentry bots, and turrets. By the time most gamers will have acquired this DLC, they will likely have powerful enough weapons to easily obliterate any adversary aboard the ship. The bonus weapons that can be found in Mothership Zeta are hardly anything to go crazy over either, as they are mainly variations of guns that can already be found in the wasteland. Although the general combat and exploration is lackluster in comparison to the main game, Mothership Zeta isn’t a total drag. The human characters you meet are mostly entertaining, and there is a certain Japanese Samurai that is especially amusing. There’s still that same Fallout charm that will keep avid fans interested throughout the 3-4 hour runtime, and the DLC caps off with a satisfying (and explosive) conclusion. It’s just hard not to feel like more could have been done with the killer concept. Nice review, I felt this dlc was a bit repetative after awhile but I suppose that will happen when stuck on a UFO. My favorite thing about this DLC was the weapons you got to haul out after you are done. They almost made me stop using my Lincoln’s repeater. Thank you! This DLC isn’t terrible but it pales in comparison to some of the others, particularly the excellent Broken Steel. Mothership Zeta was the last one I needed to complete, and going through it just made me want to restart my entire game and experience the Fallout 3 world all over again. It’s too bad the DLC ended on a bit of a whimper, though. I got all the DLC with Fallout 3 in the Game Of The Year edition but never got around to playing most of it. I was burnt out on Fallout 3 and then New Vegas came along. Planning to go back to it when they announce Fallout 4 to remind myself why I loved it so much! Yeah, I can totally understand getting burnt out on Fallout. Hell, it took me about a year to finally get around to finishing all of the DLC. I tend to pick up the Fallout games, play them a bunch for a few weeks, put them away and then repeat the process a few months later. I love being able to stop/start at any point and not feel lost. You hit on a good point about this DLC: most gamers will be super string by this time and can just blaze through the challenge. I loved Fallout 3, and honestly this DLC isn’t bad, but not a good way to end the game’s life. Have you played the, what’s it called, Point Outlook DLC, or something like that? Aside from Broken Steel, I think that one is the best add on they made. Yeah, this isn’t a terrible DLC but I wish the expansions would have ended on a better note. Point Lookout was pretty good, almost on par with Broken Steel. I think I would rank them as such: Broken Steel > Point Lookout > Operation Anchorage > The Pitt > Mothership Zeta. While only two are actually great, I am still happy to have so many ways to continue the FO3 experience. Such an awesome game. I didn’t really enjoy this DLC. Something about it didn’t draw me in. The only part I enjoyed was talking to the other ship survivors (the cowboy, samurai etc). Compared to other DLC for Fallout, this one fell below the mark. Still a fair review you gave it. Yeah, this isn’t one of the better Fallout DLCs. Completely agree that the best part was talking to the other characters. I especially loved the samurai.